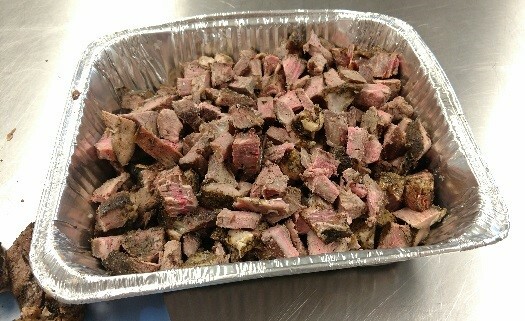 Steak bits will be combined into a meal for families in need. Have you ever gone to a restaurant and wondered what happens to prepared, unused and edible food at the end of the night? Back in 1992, concerned community members asked the same question, and a key component of Greater Lansing Food Bank’s prepared food rescue operation was born. Twenty-five years later, GLFB still picks up prepared food from restaurants, catered events, and bakeries. When too much food is prepared to be eaten or sold by our partners, GLFB rescues it from being thrown in the trash. Last year, GLFB saved more than 114,000 pounds of prepared food and delivered it directly to our agencies (at no cost to them) who can serve it to families, veterans and seniors. Food is either “ready to eat” or combined in new ways depending on the types of food donated and the capacity of the agency kitchen or shelter we deliver it to. Many of our partner kitchens are scheduled take deliveries at least once a week, and there’s often excitement among our clients about what type of food we have on hand. When possible, we try to match the rescued food with the preferences of the partner kitchen. One agency has clients that love salads, soups and vegetables that can be served that evening. Another agency has a much more structured menu that is planned in advance. This community kitchen freezes food until there is enough to recombine enough of it into a new meal. Phyllis Handley is Greater Lansing Food Bank’s Prepared Food Coordinator. This entry was tagged Greater Lansing Food Bank, Prepared Food Rescue. Bookmark the permalink.